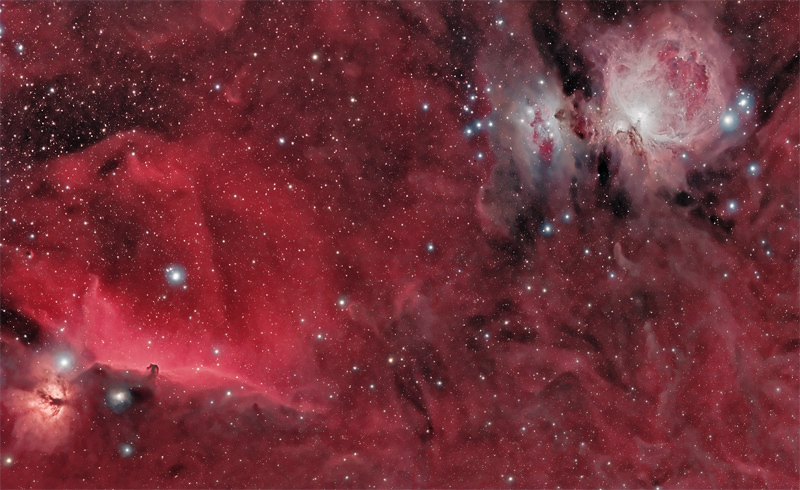 Widefield Orion’s Sword in HaRGB – APOD 5th October 2010!! The image here is the outcome of an idea that started last week, when I saw Maurice Toet’s 4 pane Mosaic of Orion’s sword area, and realised that it matched almost exacty the area I imaged in Hydrogen Alpha at Kelling Heath a few weeks back. 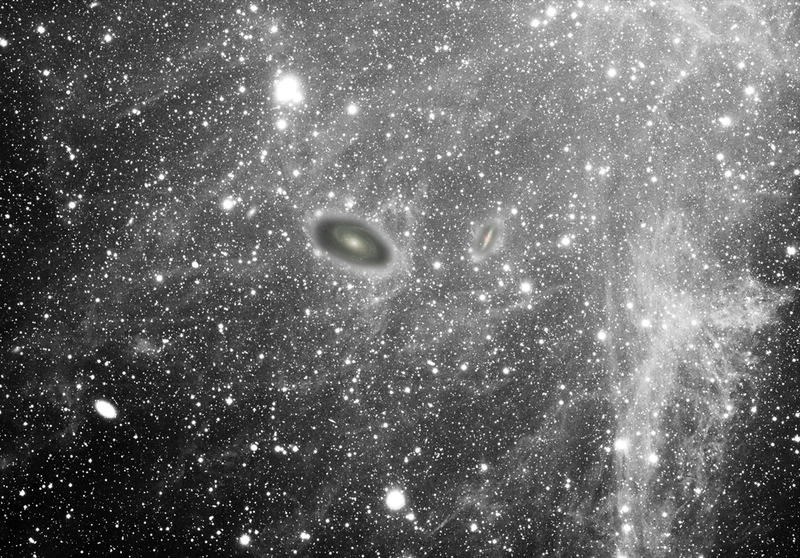 Maurice was kind enough to provide me with the TIF file of the mosaic, and I set to work in combining the two sets of data. 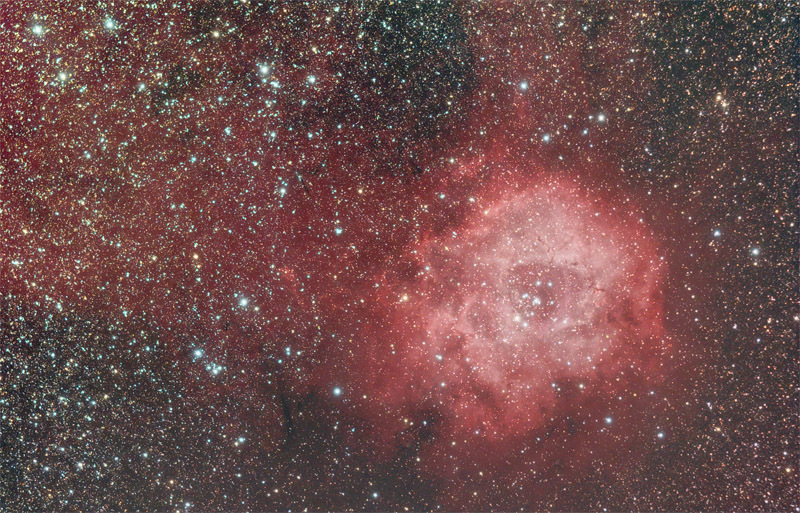 Using Registar, PixInsight and CS2, and adding in some Hydrogen Alpha data as luminance for B33 and NGC2024 from Darren Jehan and Tim Jardine, the many many hours of trial and error produced the following image. It was an absolute joy to work on, and I am not sure it could be improved all that much without a major rework from scratch. It is one of those images that require a decently calibrated monitor, as my laptop screen shows it too light and salmon pink, while my decent screens at home and at work all show a vibrant Ha red in the background. The details for the image data used in this final version is listed after the image. I would like to thank Maurice, Darren and Tim for all helping this project by allowing me to use their data. Posted by Steve under Astro | Comments Off on Widefield Orion’s Sword in HaRGB – APOD 5th October 2010!! 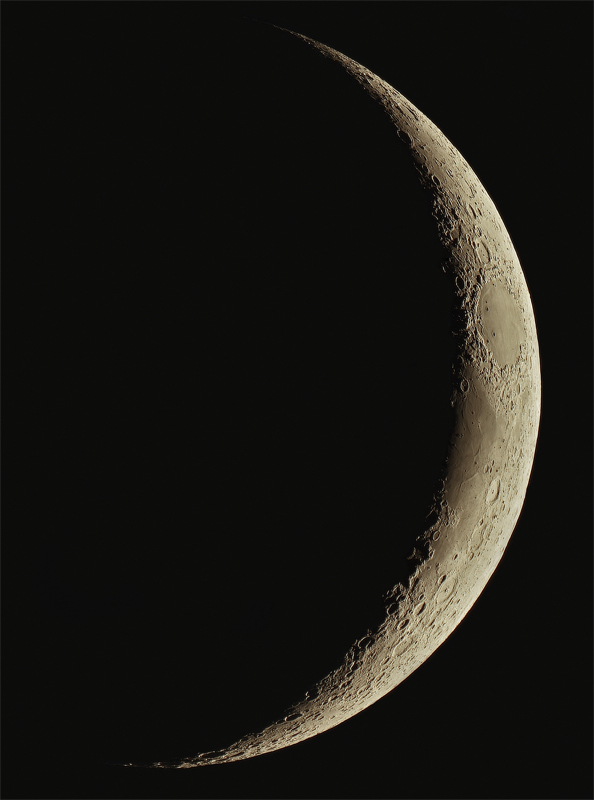 Another image from the Kelling star party. Due to the massive field of view on this, PoleAlignMax bombs out with some error message, and Pinpoint gets a bit upset too. As such, I wasnt abler to use CCD Commander to plate solve and recenter at the correct co-ords… so the image is not quite where I`d like it to be, but it will do. Here is one of the two images I am working on at the moment. Unsure how this will look on your monitor, it looks OK on my calibrated laptop, OK on my calibrated secondary monitor, but the jpg version looks much darker for some reason. SH2-129, its a faint one! After the complete disaster on Saturday night (my laptop PSU dying as I go to plug it in outside, scuppering the rest of thee vening completley), I was please to see that everything still works as it should when things go right. 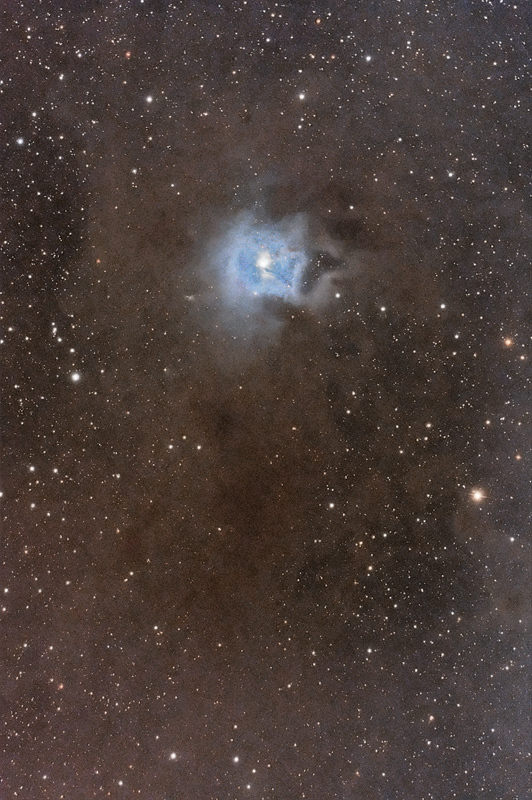 I`ve had SH2-129 on my shortlist for a while now, its about the right size for the Borg77 + M25C combo, but its always been just a bit too low in the sky (its at the tail end of Cepheus, near IC1396 Elephant Trunk Neb). With the moon glaring away in the sky, it had to be a Hydrogen Alpha evening, so I pointed at this target and let it run with 15 minute subs. I was a bit concedrned when almost nothing showed up in the first image! 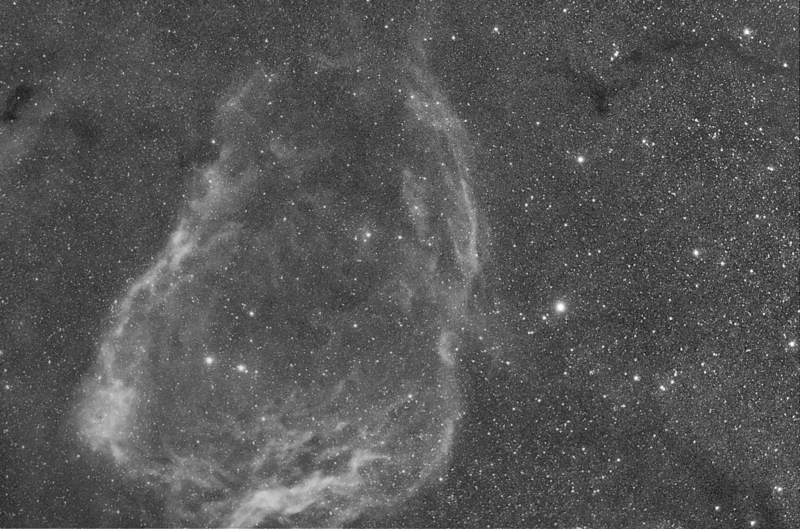 This is 15 x 900s with the Baader 7nm filter… I think it needs a LOT longer subs and a lot more combined time to get this to show te better detail, including the Barnard dark nebula areas in the image (thats B150 on top right I believe). It will also do better when it is higher in the sky, but then there will be a whole load of interesting objects around then as well. Maybe I`ll return to it…. 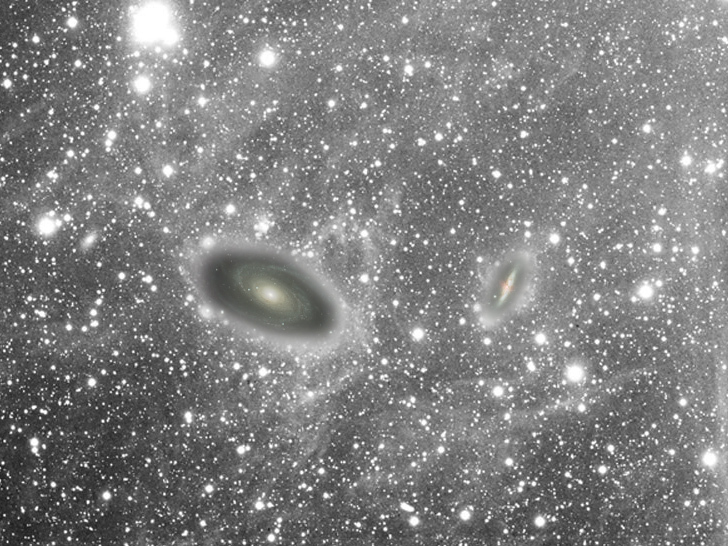 maybe..
Posted by Steve under Astronomy | Comments Off on SH2-129, its a faint one! This was the original target for the TS OAG equipped 190 MakNewt, but its been a chore to get this processed. 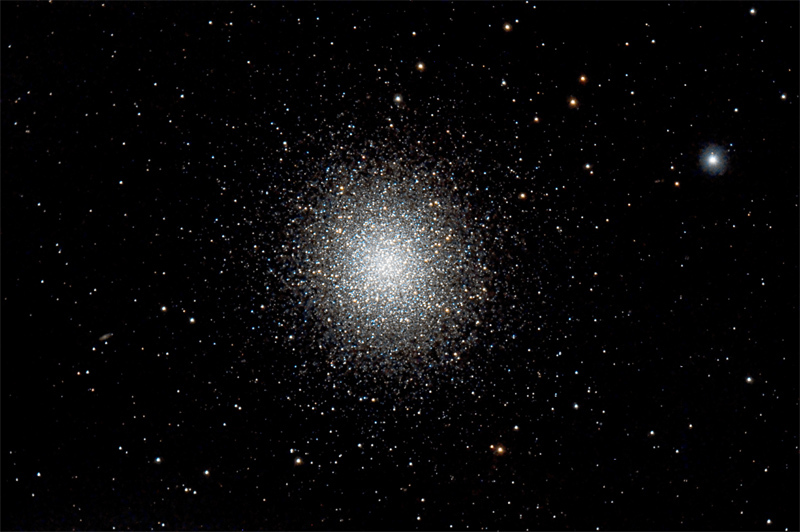 Playing with the other data (M13, NGC7023) has helped me learn a little more about the sky conditions over the two nights, plus I hadnt got Maxim to guide and dither correctly (used PHD instead), it that has caused some issues when stacking. Anyway, here it is…. I can now see why its a hard target to get good data for, the faint arms really are very faint, and any moisture or muck in the sky will fade them out. 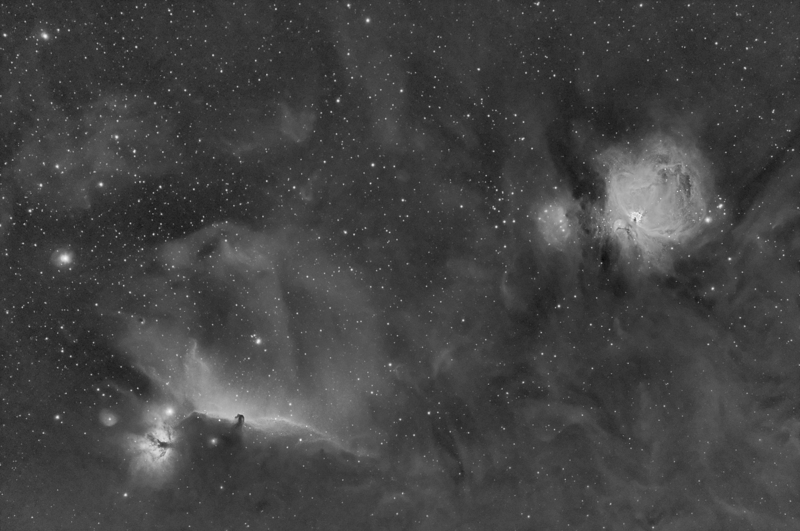 I`ll get some more data on this when I can, but I am happy with this as a real first light with the TS OAG (even it is the last of the lot to get processed). 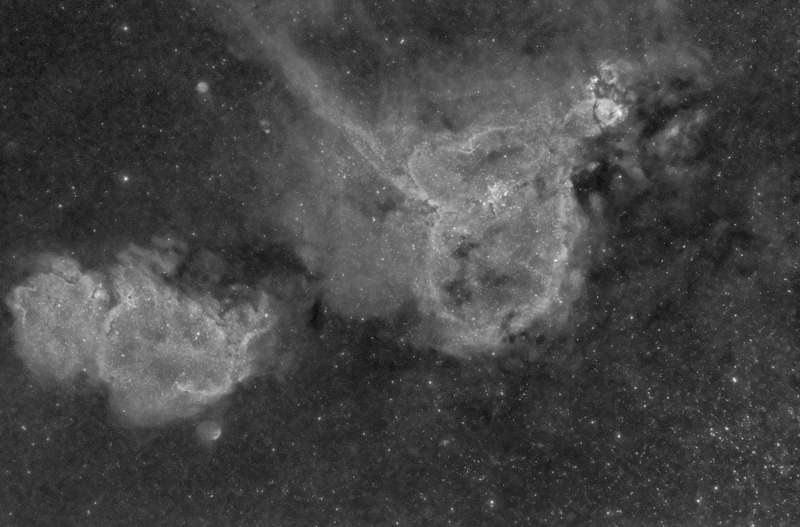 Its a bit noisy, the faint bits have had a bit too much noise reduction, there is some gradient showing in the corenrs for some reason, but I dont think this current set of data going to get any better looking than this…. 190 MakNewt, Televue 2″ 2x PowerMate, Starlight Xpress M25C. This is one of a small handful of my own personal nemesis objects, i.e. ones that I image and it never ever goes quite right, something fails, weather lets me down, contrails, too breezy, sky too murky, etc… Anyway, despite this, I tried again at SGL5, hoping that with the new TS OAG I could get the longer subs required to really show this object at its best. As it happens, the sky let me down evertually and the fog rolled in after just 90 minutes or subs 🙁 The final image is a bit noisy, and maybe has some odd gradients at the lower and righthand edges, but it has shown me that the longer subs are the way to go for targets that dont oversaturate the CCD. 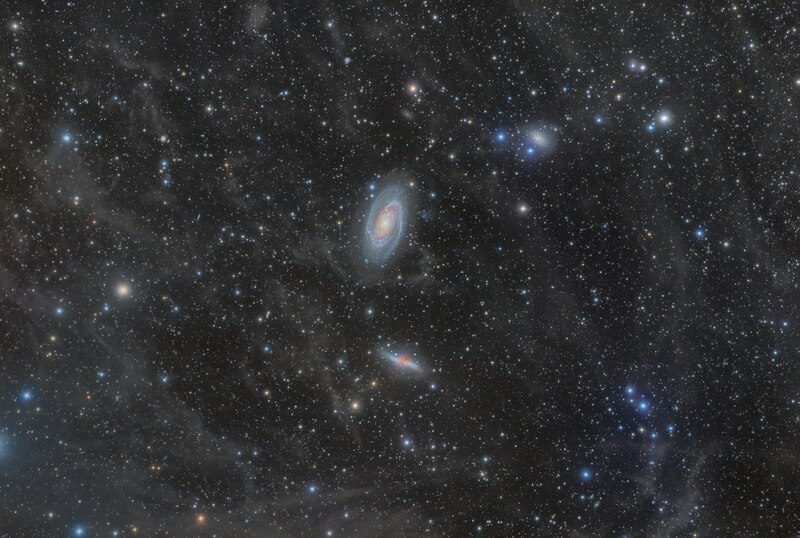 I will return to this target later in the year, and get the extended time that I so desperately require to lower the noise enough to show up the dusty clouds in the background. Note that this image looks good on one of my monitors, “OK” on another, and doesnt show the dusty clouds at all on an uncalibrated monitor at all, so if all you see is the blue part and not the clouds, try turning the brighness up a a bit. 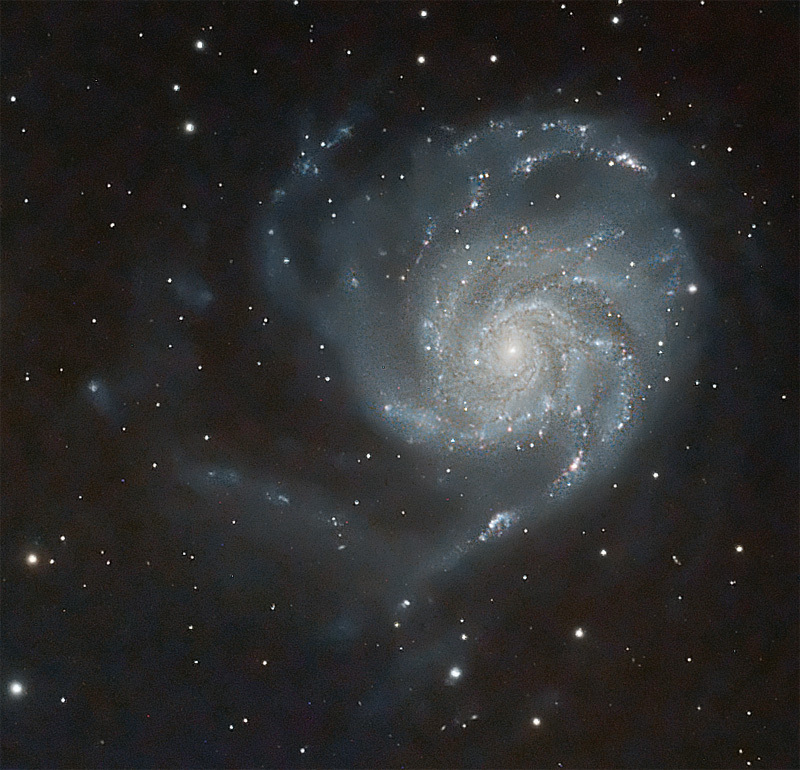 I imaged this one on Satudary night at SGL5, its an hours worth of 5 minute images. I took 2.5 hours worth, but M13 was still down “in the murk” at the start and the image quality was quite bad at that altitude. The guiding also suffered that low down, but it improved quickly as it got higher in the sky. A couple of new bits of kit involved in this image. First was the inclusion of a Teleskop Service 9mm Off Axis Guider, which took 3.5 daylight hours to get parfocal with the imaging CCD, but well worth the time spent. The other bit in this image was the use of a Televuew 2″ 2x PowerMate, which takes the 190 MakNewt from f/5.3 to f/10.6… slower but the same field of view as a C8. I`m very happy with the performance of the 190MN under abnormal conditions, I am sure that the OAG had a large part in getting such fantastic subs. 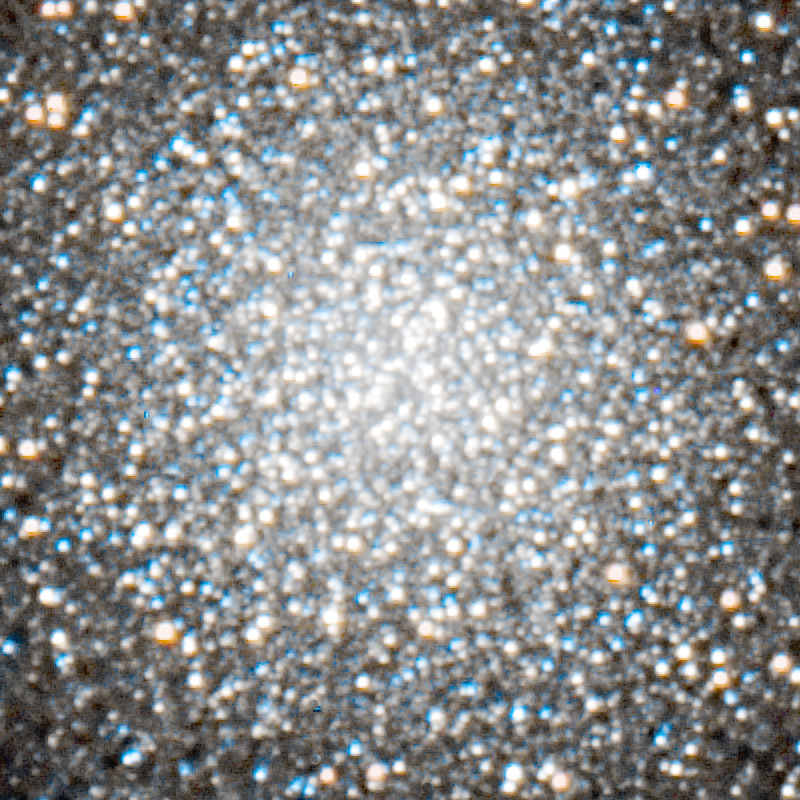 You would have thought that such a long tube OTA would have really moved around, and adding the powermate would have just made things worse, but I have included an image of the 2x drizzle cropped center of M13 to show just how round most of the stars are. Rosette, (HaR)GB, rework… a LOT of rework! 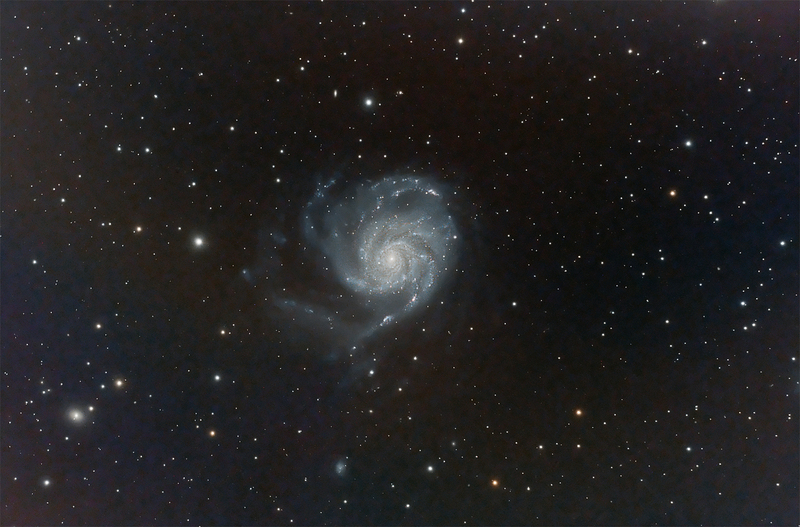 Also took on board some of the items covered at the SGL Imaging day, specifically the keeping color saturation without losing detail, and the Shadow/Highlight tool, plus managed to get a good star reduction on the image. 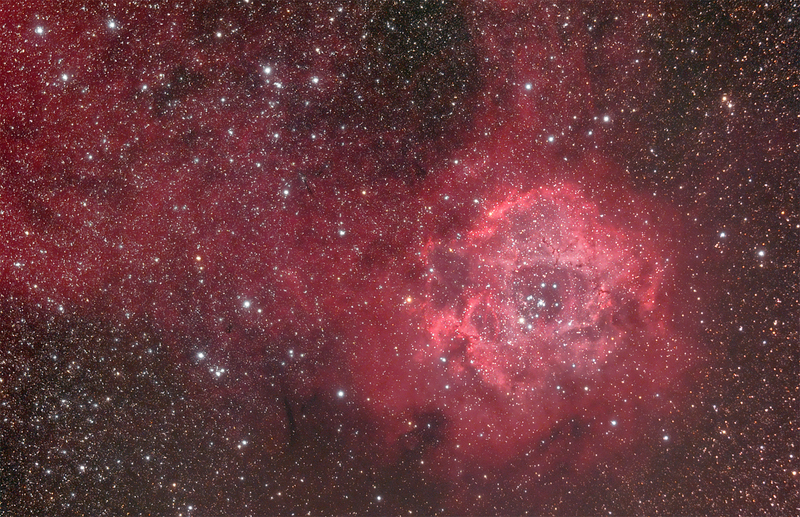 Posted by Steve under Astronomy | Comments Off on Rosette, (HaR)GB, rework… a LOT of rework! And an APOD of the same area, showing all that background nebulosity (The M81 Galaxy Group Through the Integrated Flux Nebula, Credit & Copyright: Jordi Gallego). Click on image for larger version. 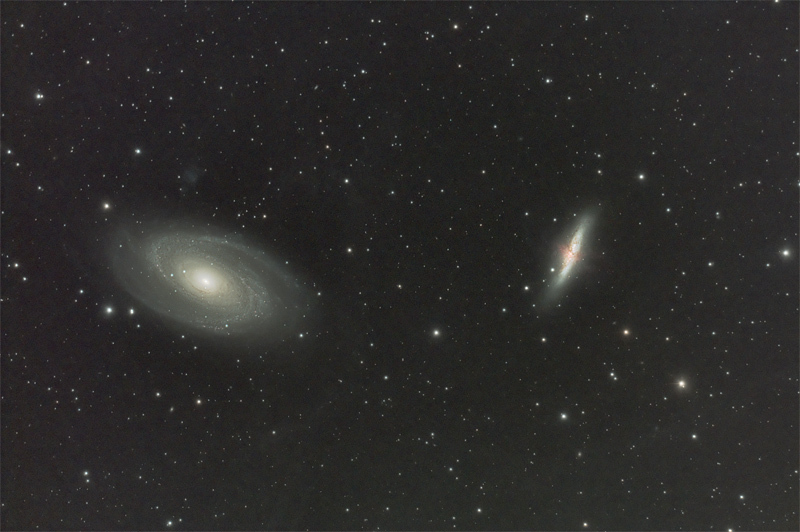 Posted by Steve under Astronomy | Comments Off on M81/M82 and Integrated Flux….